Geological period marked by the appearance of reptiles and winged insects. 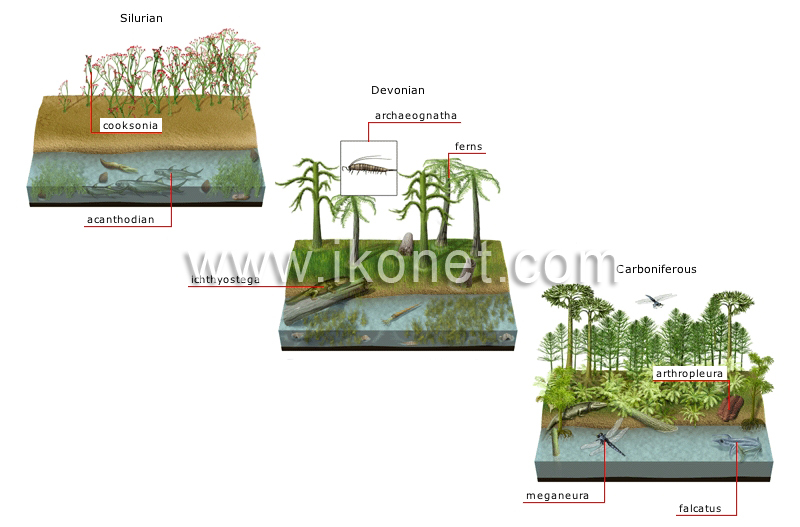 Plants (ferns, cereals) continued evolving. Shark fossil with sharp teeth. The male had a dentate dorsal fin pointing forward. Invertebrate fossil with a multi-segmented body. Found in damp forests, it measured almost 2 meters in length. Winged insect fossil. No other insect has ever reached the size of this giant dragonfly (70 cm long). Geological period marked by the appearance of amphibians, insects and the first land animals. This period saw the proliferation of fish and plants. Four-limbed vertebrate fossil descended from fish; the ancestor of today’s amphibians and one of the first vertebrates to adapt to land. These plants developed by the water’s edge. Consisting of roots, a stem and leaves, they could reach the height of present-day trees. The oldest known insect fossil; it was wingless and had long antennae. Geological period marked by the appearance of fish with jaws and the first land plants. First fish with a jaw; most of its fins were supported by a spine. It disappeared in the Permian period. One of the first land plants, having a stem but no leaves or roots; it developed in coastal and marshy zones.